A new rail link connecting Europe to China has gone into service in Azerbaijan. Spanning more than 800 kilometers, the Baku-Tbilisi-Kars link bypasses Russia and Armenia, and is part of a global project to revive the Great Silk Road. 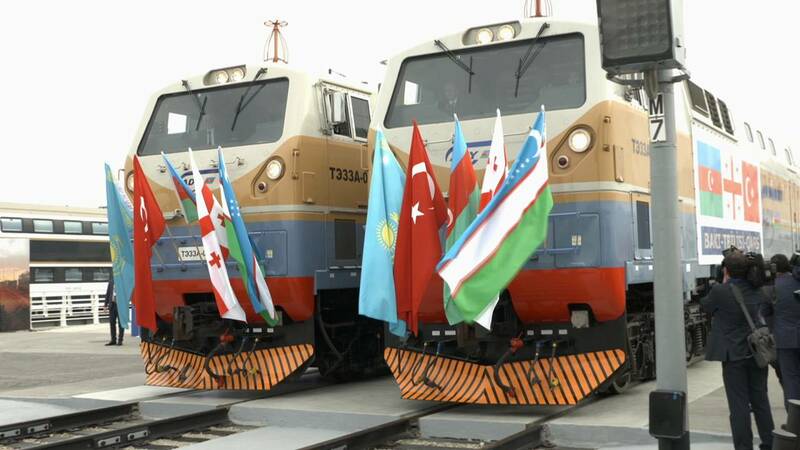 Leaders of Azerbaijan, Turkey and Georgia, who financed the rail line, were joined by their Kazakh and Uzbek counterparts for the inauguration ceremony in Alyat, southwest of Baku. “The economic value and the transport of passengers will be of strategic importance, that is beyond doubt,” said Turkish president Recep Tayyip Erdogan. The first passenger trains will start operating in 2018. Its makers say it will have the capacity to transport up to 3 million passengers a year. Azerbaijan, Georgia and Turkey are hoping it will help boost tourism to their countries. The first cargo trains have left Baku’s Alyat port and are heading for Turkey. With the journey time between Europe and China down from more than a month to two weeks, the line is expected to boost trade in the region. An initial capacity of 5 million tons of freight per year is expected to more than double in coming years – in what the partners hope will provide a good return on investment. Other countries like Kazakhstan, Pakistan, China and India have expressed interest in becoming partners of the BTK project.